Last night I was “working” at “resting” in Jesus. A memory from 40 years ago flooded my heart. I was about 30 years old and in one of those rare seasons of life where my circumstances seemed perfect to me. I was happy. My days were filled with people and things that I loved. Yet, I awakened one night to a sense of deep loneliness that could not be explained. As I processed this unexpected longing, Our Lord Jesus spoke to me and invited me to rest in a wrinkle in the palm of His hand. I pictured myself settling into this wrinkle and finding that it was shaped in a way that fit me perfectly. I was overwhelmed by a peace that would be diminished if I tried to describe it with words. The next morning I told a friend who had been a missionary in Brazil this encounter. She told me of a carving she had seen in Brazil of a little girl resting in God’s hand. She said my story brought this carving to mind. A couple of days later I was stunned to get a postcard from a friend in Amsterdam with this exact picture. 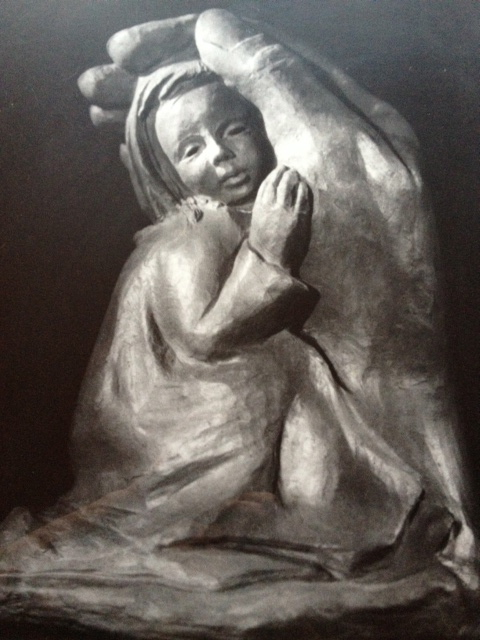 It was a photograph of the carving described by this friend from Brazil. God had spanned space and time to reinforce to me his invitation to snuggle into the wrinkle in His hand that was designed for me. This entry was posted in Uncategorized and tagged Amsterdam, Brazil, carving, friend, God, hand, invitation, Jesus, memory, palm, peace, photograph, space, time. Bookmark the permalink.